The Cruelty, a young-adult thriller, is the fictional debut of Scott Bergstrom. 17-year-old Gwendolyn Bloom has grown up a transient loner, thanks to her father’s job in the diplomatic service. Her circle of friends is small and her life in New York is insular, making her an outsider at her new school. Her life is rather unremarkable, following the death of her mother at a young age, and she seems satisfied with that, until her father goes missing. At this point she discovers the truth: her father is a CIA agent. Over the next few days, it becomes apparent that there is unsurmountable evidence that he has turned against his country. Refusing to believe this, and accept that her whole childhood and relationship with him has been founded on lies, Gwendolyn takes matters in to her own hands. Creating a new identity for herself, Gwendolyn goes to Europe in search of her father. Through this journey, Gwendolyn’s character evolves as she finds herself in the seedy underworld, forced into situations beyond her imagination. Bergstrom draws on mature themes to create a dark and gritty world which gets the reader to question how far they would go for their love of someone, and if they can be the same person at the end of it. While it requires a suspension of disbelief that a 17-year-old high-school student could turn into a world-class assassin, Bergstrom crafts characters who are likable, and creates a sense of realism. Gwendolyn’s immediate appeal to the reader as a socially awkward loner gives us immediate access to the story, despite the all-too-common trope of American high-school outcast. The plot is conventional enough, following similar story lines as other spy thrillers, but with the reversal of the usual father-daughter relationship adding a new dimension. I think it is great that the novel seeks to create a strong, courageous heroine who is every bit as strong as the cruel men that she faces, within a genre outside fantasy. Well-crafted and with strong appeal to the YA target market, this book has already been optioned for film and, with its cinematic appeal and global settings, it’s easy to see why. While many readers may be slightly disappointed with an ending that leaves a few threads untied, I think it creates further intrigue. It also avoids the clichés of happy endings, and will hopefully lead to a sequel. Rachael Wardle is assistant headteacher at Lymm High School, in Warrington. I wasn’t sure what to expect at first. “The girl hunted…becomes the woman who hunts” wraps round the front and back covers, so unsurprisingly I was intrigued. The thing I liked most about The Cruelty was the relativity of it. Gwendolyn Bloom is a typical teenage outcast, the type you can find in almost any YA book ever. I do hate how unoriginal her character is, but can’t help love her nonetheless. After what could be considered a slow start, all hell breaks loose, when innocent Gwen finds herself on a mission to find her father (still clichéd, I know). From here, however, the true (false) Gwen is born, and the action begins. As for the storyline, I was surprised at how down-to-earth it was, in a strange sort of way. 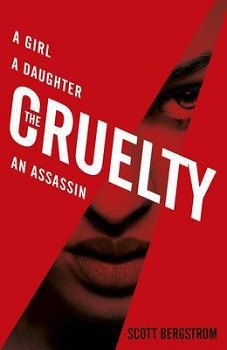 Unlike some of the other YA books I’ve read, The Cruelty seems more realistic and raw, and less fantasised. Until the ending, that is, which is mostly predictable. I would much rather the ending have been the beginning of the second book, but then also would have probably been more frustrated at not knowing. The Cruelty may not be flawless, but with a fantastic selection of characters and a gripping plot, I’d recommend it to anyone looking for a quick escape. Filled with action, The Cruelty is a book containing thrilling events throughout. As a reader, you are submerged into a world of secret underground criminals within some of Europe’s most well-known cities, and you experience the danger and way of life that these people face. The book begins however very slow-paced and has a clichéd style, with the main character Gwendolyn Bloom as the social outcast at school. I found that it was quite laborious to be able to make a connection with her within the first few chapters of the book. Nevertheless, as the book progresses and we get to know her more as she develops into a strong, adamant young woman facing utter hardship to try and find her father, it is very easy to be able to take a liking to Gwen. Unrealistic? Yes, there are many events which take place that appear to be completely unrealistic and are very gruesome, dealing with perhaps more adult-suited themes such as human trafficking. But they are real life issues, and I enjoyed reading a genre which I wouldn’t usually choose for myself. Overall, The Cruelty is a dramatic thriller, ending with the possibility for a whole new series. Despite the slow start, which was tediously smothered with clichés, I found the plot very intriguing. With plenty of suspense, anticipation and many unanswered questions, The Cruelty certainly held my interest. By following the protagonist Gwendolyn’s train of thought and witnessing everything through her, I found myself constantly asking questions. The various cliffhangers, which were cleverly placed throughout the book, also kept me thoroughly engrossed in reading. However, I struggled to connect with Gwendolyn. Even after seeing how she developed into a ruthless fighter, I still felt there was not much depth to her character. Her levels of maturity were constantly switching unrealistically. I also found that her startling intelligence made her unrelatable. It often felt as though the author had a checklist of traits that the main character should possess, or events that should happen to her. Then, once they were used, they were tossed away. This created an element of confusion and the sudden jumps throughout the book enhanced this feeling of disorientation. This is not the type of book I normally read – I usually read history or fantasy books. But I gave it a go and I am so glad I did. I loved how you could really see how much Gwendolyn grew throughout the book. I can’t say I was hooked from the very first page, but a few chapters in and I was gripped by the storyline. I think about it now and realise how raw and honest it actually was. It shows what the world would actually be like in that situation and said things you wouldn’t expect to be done and said in a book but are said across the world every day. I admit it was a clichéd beginning: unique hard-done-to teenage girl finds a guy who likes her for herself. But one of my favourite parts of the book was when they make contact – I thought that was so cleverly done. The story has great detail, and the characters are well-developed and change throughout the story. Unlike most books, it actually managed to make me feel Gwendolyn’s anger and frustration.